Winds have picked up in parts of the county as a fire weather warning takes effect Wednesday. During this mild to moderate Santa Ana, fire danger will be elevated. 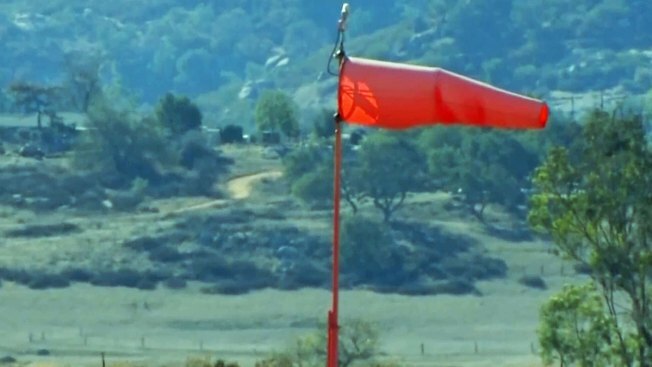 The San Diego National Weather Service issued a red flag warning for the region’s foothills and valleys until 4 p.m. Thursday. The warning was issued due to high winds, estimated to be 15 to 25 mph with 45 to 50 mph gusts, and low humidity. “At 11:30 this morning, it hit 94 degrees at Lindbergh Field,” NBC 7’s Whitney Southwick said adding that the old record was one degree lower set in 1904. The Santa Ana Fire Index rates the risk of fire potential as marginal for the next 48 hours. If a wildfire sparks, there is a chance it may grow rapidly according to the index. Winds will die down Wednesday evening before picking up again Thursday morning, Southwick said. For those headed to the beach for some relief from the heat, watch out for the high surf advisory along the coast. The San Diego Fire-Rescue Department has placed five additional fire engine companies on duty through Thursday. Also, the two firefighting helicopters within SDFD will be staffed 24 hours per day. “When you combine the forecast with the extremely dry vegetation, the potential for wildfire is elevated,” Fire Chief Brian Fennessy said in a written release.